A History of George Mason University | John Norville Gibson Finley to E. DeLong Bowman, January 17, 1955. 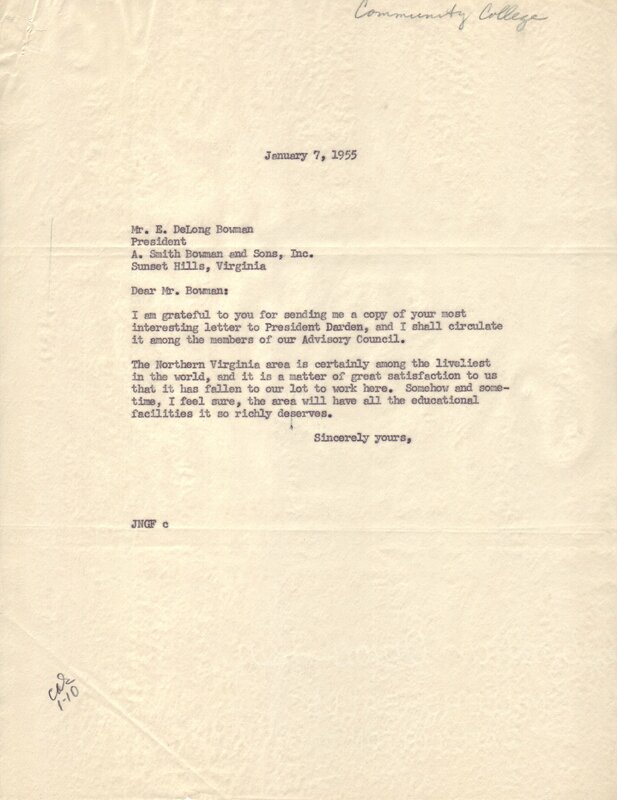 Carbon copy of Finley's reply to E. DeLong Bowman's letter of December 27, 1954 in which Bowman informs Finley of the offer of land he and his brother, A. Smith Bowman have made to President Colgate W. Darden, Jr. of the University of Virginia on which to build a branch college. January 17, 1955. One page. Citation: Finley, John Norville Gibson, “John Norville Gibson Finley to E. DeLong Bowman, January 17, 1955.,” A History of George Mason University, accessed April 24, 2019, http://ahistoryofmason.gmu.edu/items/show/21.